At the core of our orthodontic practice is a friendly team of professionals that are dedicated to your utmost comfort and optimal oral health. We view each patient as a unique individual, and tailor each treatment to your specific needs. As part of our commitment to providing close, personalized attention to every patient, we want to encourage patient communication. Please know that we are here to provide outstanding patient care, and that we value the trust you have placed in us. 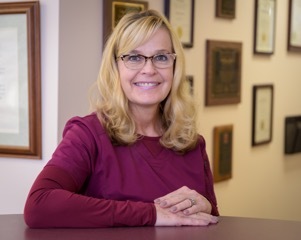 Dawn had the pleasure and takes pride in being Dr. Banning’s first employee when she opened her practice in January, 2003. Dawn is a graduate of Tamaqua Area High School and McCann School of Business. She put her multitasking skills to work by starting off doing a little assisting with Dr. Banning and front office duties. Once the practice started to flourish, she settled into the administrative part of the practice. Parents and patients appreciate her delightful welcome and her above and beyond attitude in making their experience at the office as pleasant, personable and convenient as possible. When not at work, Dawn enjoys spending time with her family and friends, singing, dancing, and attempting to finish books Dr. Banning loans to her. (ha!) She resides in the Tamaqua area with her husband, Josh, and her son, Josh, and a spoiled boxer-terrier mix dog, Tex. 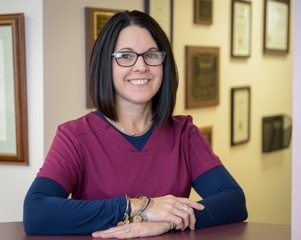 Why Dawn Loves Orthodontics: She loves working as part of a terrific team who all play an intricate part in the beautiful smile making process. Why Dawn Loves Banning Orthodontics: She loves that Dr. Banning cares deeply about parent/patient satisfaction and instills this in her entire staff. The best part of working here is the opportunity to meet a lot of great families and see the joy the patient experiences when they flash their Banning Orthodontics Smile for the first time. It is both gratifying and rewarding for all. Nicki joined our front office gang in the fall of 2018. She may be new to Banning Orthodontics, P.C., but she is not new to the dental field. She was the office manager of an oral surgery group for 23 years. She has plenty of experience with local dentists, insurances, and customer service. Nicki is a graduate of Marian High School and received her BS degree at Jefferson University (formally known as Philadelphia College of Textiles and Science). She is certified to take oral x-rays, CPR, and office anesthesia training. Throughout the years Nicki has taken many courses to better herself in her career. She has taken courses regarding insurance claims, dental and medical coding, ICD-10 coding, billing, HIPAA, and many more courses to better herself and the offices she has worked for. Nicki lives in the area, and spends most of her time outside of work with her family. She is married for over 20 years to her handsome husband Matt, and they have two loving children together, Bella and Tate. They have a wonderful little spit fire of a dog, Nessie. Nicki loves to sing (mostly all of the wrong words, LOL), read, sew, tea cups, ELVIS, and spending time with family and friends. Her handwriting and spelling have always needed work. Why Nicki Loves Orthodontics: She loves working with the community. It gives her a great joy to see patients excited to come to their appointments. Why Nicki Loves Banning Orthodontics: She loves the family feel at Banning Orthodontics, P.C. The staff makes it fun for her to come to work. You will always see smiles, giggles, and laughs through out the day. Dr. Lisa Banning truly cares about her staff and patients. Working in the community she grew up in and lives in makes it feel even more family oriented and special. 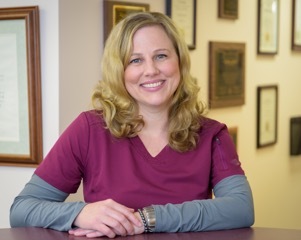 Lisa joined our orthodontic team in 2005. She has been working in the dental field for more than 15 years. She works in our office as both a clinical assistant and director of our in house lab. She is responsible for fabrication of all patient pre and post treatment models, supervising all appliances fabricated at outside laboratories, and fabricating all essix retainers. She is fantastic in handling our younger or scared patients. Her bedside manner is second to none. She is also our best photographer and has a way to relax all patients in front of the camera. She lives in the Tamaqua area and has two children, Joseph and Alexis. She has one grandson, Declan. She also has a German short hair dog named Sage. In her spare time she enjoys the outdoors and is an excellent hunter and fisherwoman. Why Lisa loves Orthodontics/Banning Orthodontics: She loves watching the joy of our patients and families when their orthodontic treatment is complete and they have that beautiful smile. Andrea has been working as an orthodontic assistant in the dental field for approximately ten years. She joined the Banning Orthodontic family in 2009. Andrea is a graduate of the Dental Assisting program at Schuylkill Training & Technology Center located in Frackville. Andrea is also certified in Dental Radiology and participates in continuing education in the ever changing world of radiography. Not only does Andrea assist in the clinic area, but she is also proficient at the front desk. From time to time you will see her at the reception area answering phones or scheduling appointments. She has a special way with communicating to parents regarding their child's orthodontic care. Andrea is a 1998 graduate of Pottsville Area High School and resides in Pottsville with her daughter Kylie, her fiancée, Mike, and their Chiagles, Pig and Katie, a Shepard Husky, Pepper, and a rescue cat, Libby Lou. She enjoys trips to the beach especially Atlantic City and Cape May, loves to attend Eagles and Phillies games, going to concerts, 4-wheeling, camping, reading a good book, and taking the dogs hiking in the woods. Why Andrea Loves Orthodontics: She enjoys the relationships and friendships created with patients. She feels each patient is unique and special, and as an assistant, feels it is her job to make them feel as comfortable as she can when they are in her chair. Why Andrea loves Banning Orthodontics: “In all my years of working in the Ortho field, I have never seen a doctor that genuinely cares about her patients and has no problem spending time with the patients.” My co-workers are like a family. We all work together as a team and are always there to help each other. Debbie is the newest member to our team. She has over 20 years of orthodontic assisting experience and is able to work in all facets of our practice. She enjoys working with both patients and parents, taking pride in her work and enjoying new smiles take shape during the orthodontic process. Debbie is originally from New Ringgold and currently resides in Pottsville with her husband and three "puppies".... a Boston Terrier, a fourteen year old Boxer and her baby a 180 pound 16 month old English Mastiff. She enjoys walking and just being outdoors. She loves to travel, with Boston being one of her favorite cities though she is a die hard YANKEE fan. She loves the beach and one of her favorites is Jekyll Island, Ga.
She loves orthodontics because she loves to watch the change that takes place with the young people, from the first visit to the completion of treatment. To see that smile at the end of treatment and watch the pride they exhibit is rewarding to her even after 23 years. 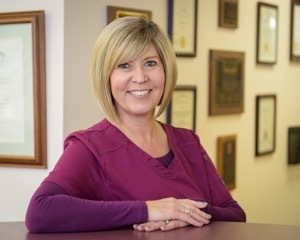 Lisa joined Banning Orthodontics in 2010, bringing eight years of clinical experience to our team. She is an excellent clinician and is often the person that Dr. Banning will turn to for assistance with difficult procedures, particularly on younger patients. Lisa is responsible for monitoring and ordering all supplies necessary to keep the practice running. She may be seen scouring over catalogues always looking for the best quality item at the best price. 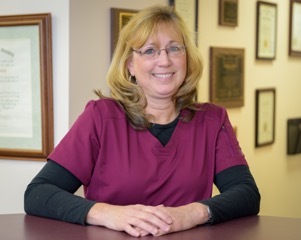 She oversees any necessary equipment repairs or additions and talks/meets with all dental reps. Lisa and her husband Henry reside in Tamaqua. She has a daughter Elizabeth who is employed as a hygienist in the dental field. She has two step sons, Dylan and Lee, and was recently blessed with a granddaughter, Paige. In her free time she enjoys cheering for the Pittsburgh Steelers. Why Lisa Loves Orthodontics: Just seeing the transformation from start to finish and the joy on the patients face when their braces come off…is priceless! Why Lisa Loves Banning Orthodontics: The positive friendly atmosphere that really makes it enjoyable to go to work. Jackie is the newest member to our team. She joined us in January of 2015. 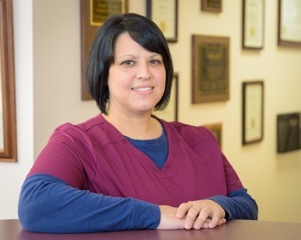 She comes to us with more than a decade of orthodontic assisting experience from the Lehigh Valley area. She takes pride in her work, and especially enjoys each patient’s journey to a new and improved smile. Jackie is originally from the Allentown area, currently residing in Slatington with her husband and two children Kyle, and Rachel. Outside of work she enjoys spending time walking her two dogs Lacie, and Mylo, biking and hiking trails with her husband , and attending her daughter’s field hockey games at West Chester University. She looks forward every year vacationing with her extended family to the beach in Bethany Beach, DE. Favorite Movies: Any good chick flicks, especially Nicholas Sparks movies, The Hunger Games. Favorite Sports Teams: Philadelphia Eagles, and Penn State Football. Why I love working at Banning Orthodontics: In all the years I have been in Orthodontics, I have never experienced the genuine care she gives to ALL her patients. Everyone is so pleasant and eager to help out whenever necessary . We pride ourselves on the teamwork that goes into every patient’s new smile.